For my Norwegian readers: For noen dager siden ble jeg kontaktet av The Economist, som var ute etter opinion leaders around Europe to ask them where they get their ideas (their ‘thinking space’) and we felt you fitted the criteria perfectly. Derfor denne artikkelen på engelsk. When this is written, I’m sitting in a sofa trying to make my brain produce something decent about a digital strategy for Norway, just like the British one. I’m currently in what The Economist defines as Thinking Space. We are currently helping The Economist get in touch with opinion leaders around Europe to ask them where they get their ideas (their ‘thinking space’) and we felt you fitted their criteria perfectly. The task is to describe what my creative process looks like, related to create my opinions on certain topics. It’s an abstract task to describe a side of me that I do not even know how works. In that matter, it’s a recursive task. The task is to answer a couple of questions and publish the answers in this blog. What is your current profession and how did you choose your career path (where did you study, learn, become inspired)? Currently, I’m the CIO of the Norwegian Open Soucre Competence Center. The main goal for my career is to be heard, to influence people, to inspire people, companies and organizations to change. Information Technology has always been my beloved industry, since IT is affecting us all in some way, either at home or at work, as well as in the infrastructure of our society. Since graduating from college, I’ve always wanted to be heard, to make a difference. Reading books, magazines, newspapers, blogs and online media to get information and become inspired, I now find myself in a slightly different position, to create my own opinions and publish them in the same medias that I like to read. Furthermore, a strong will to see potential change in almost every aspect of IT, makes it a lot easier to generate ideas. Where did you grow up? How did it influence who you are today? I grew up half an hour west of Oslo, the capital of Norway, in a small, stable, safe and quiet community with great surroundings close to nature. Both my parents are people of few words, being reflective, calm and stable, but we all love a good discussion. I’d like to thank my parents for passing on their reflective skills to me. I can sit around for hours, just to think. My father always says that, if there’s something making you feel down, have a run in the forest. Getting older, I realize that he’s right. As always. Nature. I love our nature and to use it in ways that’s non-destructive for it, like hiking, skiing, riding a bike, running orienteering, et cetera. Also, I love to read. As mentioned, I read all sorts of information, from paper-based books, magazines and newspapers, to online media like blogs, newspapers and magazines and social media. Not to be taken for granted, I also love my friends and family. A Thinking Space is a place or a mental condition enabling me to create opinions or ideas, or simply being creative. Being creative is not something that I can turn on and off, like a switch. Creativity comes to me at the strangest places, in the most inappropriate hours of the day. However, there’s a clear connection between the surroundings that I’m in, and the amount of creativity falling into my head. Since I’m being paid, among other things, to be creative, I really enjoy my office being such a nice place to get inspiration. In the first two pictures, I’m standing on the roof of my office building. There’s a terrace with small chairs and tables, where I sit quite a lot, either alone, or with my great colleagues, discussing topics of all kinds. Letting go of the computer, letting the thoughts run free without limitations, is the absolutely best way to generate ideas and to process existing matters. Especially being outdoors, where inspiration is easy to find. From the office roof-top, we can watch the river, the city center with the market place in the summer, the harbor and the surrounding hills, covered with dense forest. The alternative, to sit indoors, for example in a cubicle, is not very productive. I cannot imagine how anyone can be productive by staring into four white walls and a computer screen all day. 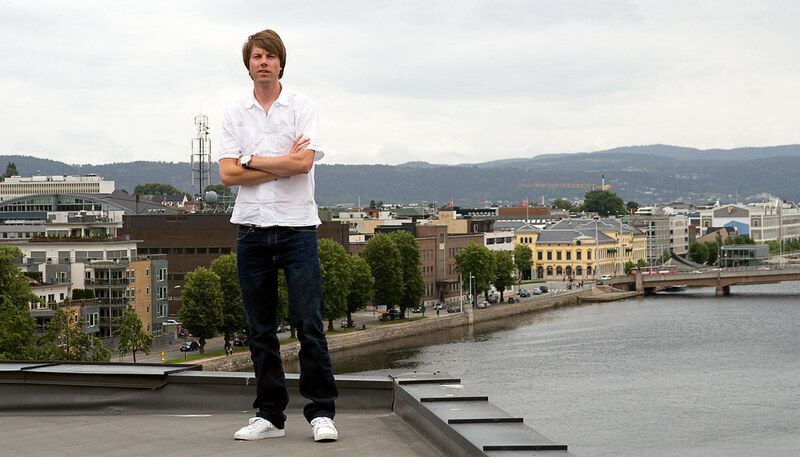 That’s why we also have large windows at the office, letting us look out at the same surroundings as from the roof-top. At the same time, there’s a lot of tools I use to get through the day. 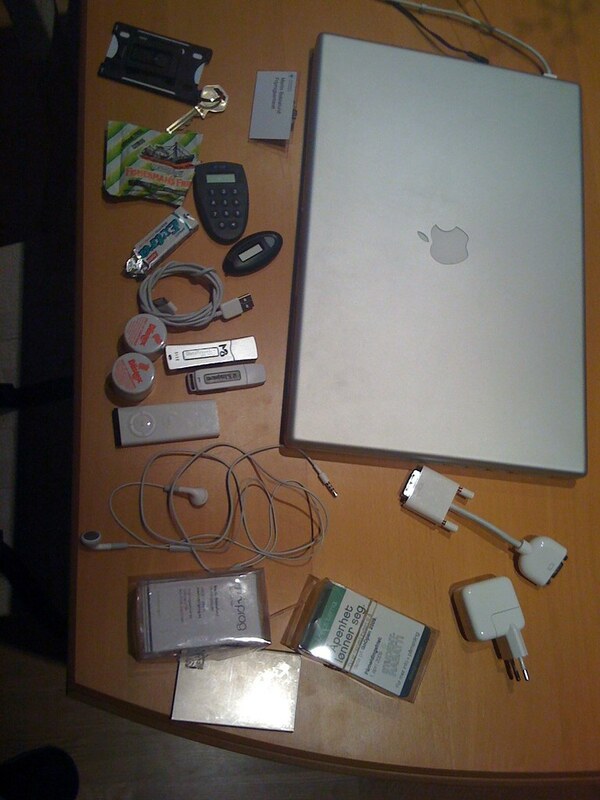 In the picture above you see the tools I use every day, everything from my beloved Mac and iPhone, the business cards, chewing gum and mints, to the tools used to give a great presentation. It all starts with creativity, then gets presented either as text in magazines, newspapers or online, or as presentations and speeches. For me, great surroundings, a stable and solid network of family, friends and colleagues, makes up my Thinking Space. To support this, I also use a set of tools, as shown in the picture above. That’s me. What about you? What’s your Thinking Space? Of course, you may click all pictures to enlarge.